Bangladesh saw some significant achievements in its diplomatic front in the outgoing year thanks to its time-befitting and calculated moves on different local and global issues. 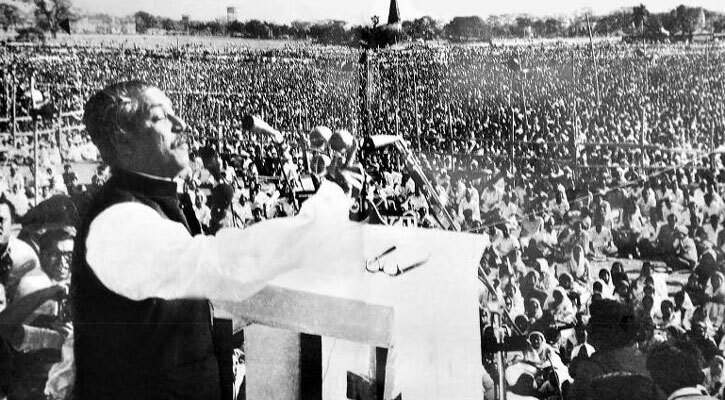 With its diplomatic efforts, Dhaka earned recognition for the historic 7th March Speech of Bangabandhu Sheikh Mujibur Rahman as the world’s documentary heritage from the UNESCO. The UNESCO has also recognised Mangal Shobhajatra, the Bangla New Year procession, and the traditional art of Shital Pati weaving of Sylhet as Intangible Cultural Heritage of Humanity in the year. As a result of its diplomacy, Bangladesh has also earned huge applause from the international community for fighting militancy and extremism very successfully. Talking to media, State Minister for Foreign Affairs Md Shahriar Alam on Thursday branded the outgoing year as another milestone in the current government’s success in putting diplomacy in a thriving trail. “We achieved great successes on our diplomatic front through a strong foundation of the foreign relations in light of our foreign policy,” he added. The roles of Prime Minister Sheikh Hasina in reducing child mortality rate and advancing in gender equality and women education have received widespread admirations from across the world throughout the year. In 2017, Bangladesh has also set a milestone in global peace-building by sending two women pilots and one woman physician to the UN peace-building mission for the first time. Sheikh Hasina has continued to brighten the image of the country through her decisive roles in different international forums over some global issues, including Jerusalem. Hasina’s valiant roles in tackling the Rohingya crisis have earned her the recognition of the global leader and statement. Some international media have branded her as the mother of the humanity, new star of the east, and ambassador of peace to name a few. In continuation of the recognition, Forbes has ranked Hasina as the 30th most powerful women of the world. The Bangladesh premier has moved up to 30th on the list of 100 most powerful women in the world this year, from the 36th position in 2016. US-based influential business magazine Forbes dubbed her as the “Lady of Dhaka” for sheltering the Rohingya people in Bangladesh. The outgoing year has also witnessed a huge number of high-level foreign visits, which are also seen as the successes of the government. Sheikh Hasina’s visit to India is considered one of the most significant and successful events of the diplomatic arena of the year. During the visit, Indian Prime Minister Narendra Modi set aside protocol and personally received her at the airport. The visit has injected a new momentum in bilateral ties between two neighbouring countries, taking the relations to a greater height. Hasina has also played vocal roles in the Arab American Islamic Summit in Riyadh and the 2nd Asian-African Conference in Jakarta, Indonesia in the year. Dhaka hosted a number of high-level foreign visits including presidents of Sri Lanka and Palestine and Premier of Turkey in the outgoing year. Indian Foreign Minister Sushma Swaraj and Finance Minister Arun Jaitley, two imams of two holy mosques of Mecca and Medina have also visited Dhaka. Apart from them, the OIC General Secretary, Thai and Indonesian Foreign Ministers and Pope Francis have also visited Bangladesh in 2017. The government has shown its diplomatic mettle in handling the Rohingya crisis and earned huge applause from the international community. The crisis has put the country in headlines in the international media and many foreign dignitaries visited Bangladesh to see the plight of the Rohingya refugees for themselves. Among them, Foreign Minister of Germany Sigmar Gabriel, Foreign Minister of Sweden Margot Wallström, Foreign Minister of Japan Taro Kono and High Representative of the EU Federica Mogherini visited the Rohingya camps in Cox’s Bazar. The foreign ministry had to go through the hassle of hosting a huge number of delegations from the US, the EU, the UK and the UN into the country every day after the recent Rohingya influx began. Alongside with the Prime Minister, Foreign Minister AH Mahmood Ali, State Minister for Foreign Affairs Md Shahriar Alam, and Foreign Secretary M Shahidul Haque also visited different countries world to garner support over the Rohingya crisis. As a result of its hectic diplomatic efforts, Bangladesh could sign arrangement and form a joint working group with Myanmar for the repatriations of the Rohingya people. The efforts have brought both the countries very close to begin repatriations and it might commence by the first week of February. Bangladesh has also proven its worth in parliamentary diplomacy by hosting the Inter-Parliamentary Union (IPU) Assembly and 63rd Commonwealth Parliamentary Conference (CPC) of the Commonwealth Parliamentary Association (CPA) in Dhaka in the year. As part of the expansion of its presence abroad, Dhaka has established new missions in Nigeria, Assam of India and Ethiopia in the outgoing year. The government has also earned huge success in regularising over half a million Bangladeshi workers in Malaysia in 2017. Former Ambassador AKM Atiqur Rahman told the daily sun that on the other side of the success stories, the country had faced some failures in diplomacy in the outgoing year. Besides, the government was able to brighten the country’s image abroad through time-befitting roles on different issues, he added. However, the failure of signing Teesta Water Sharing Treaty with India has widely been criticised by the detractors of the government throughout the year. The government has also taken a lot of flak for its failure to persuade China, Russia and India to stand by Bangladesh over the Rohingya crisis.